There are endless all occasion beautiful commercial magnets available on the web but nothing can be compared to a hand made product created by you. If you like DIY projects, this one is just for you. Your guests will be delighted to get these little favors. 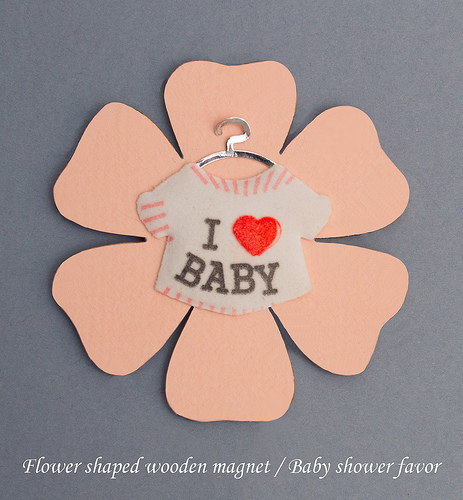 These make nice favors for a baby shower. They are easy and quick to make and look impressive on the fridge. 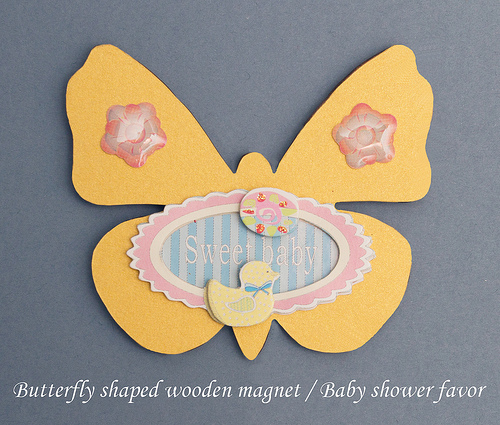 In the examples below we used commercial wooden shapes and commercial hand made stickers. 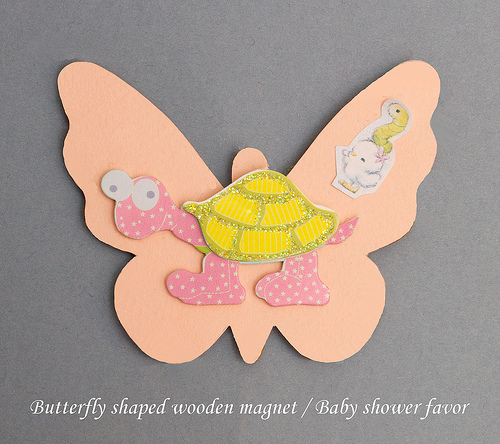 Please scroll down the page to see the enlarged magnet designs. Step 1 Paint the wood and let it dry. Step 2 Cut a piece of magnet about 1" long with scissors. 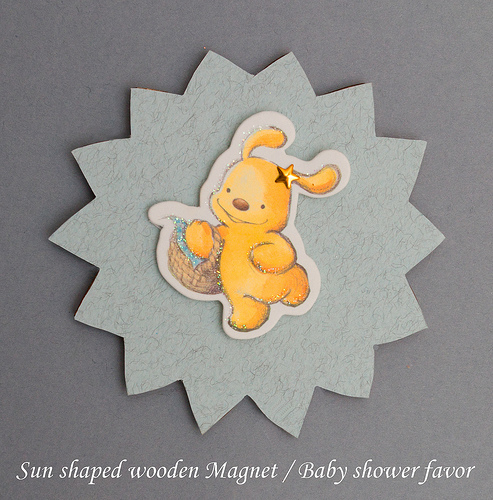 Step 3 Peel the paper off the back of the magnet and stick it to the underside of the wood. 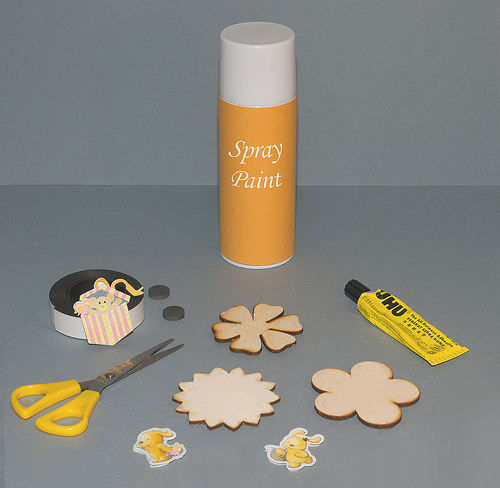 If you use the circular magnets use a strong glue. These magnets are stronger than the magnetic roll. Step 4 Stick the decorative stickers to the front. We recommend using additional glue for extra strength. For presentation purpose only we used colored decorative paper for the ground. Although impressive, we would not recommend it for big quantities as it is time consuming to cut each complex shape separately. We suggest painting the wood with a waterborne enamel spray paint, it takes only few minutes to apply and it gives a lovely effect. There are beautiful, quick dry eco friendly paints on the market which are very pleasant and easy to use. Looking for more ideas? Click here . 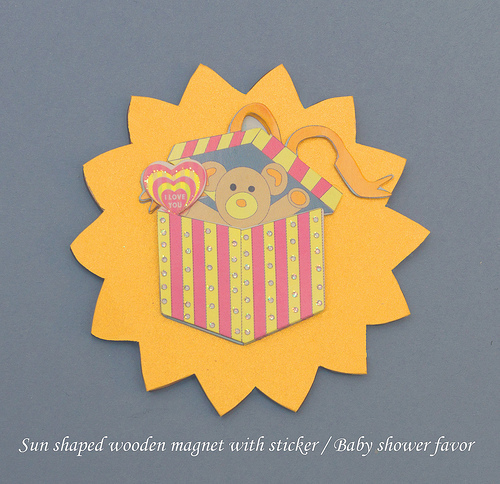 Tip type Dimensional Stickers and Wooden Shapes in the search box and you will find a large variety of these materials. Because these are fridge magnets we photographed them against a neutral solid grey ground. We attached them to our metallic grey fridge and they look just great. 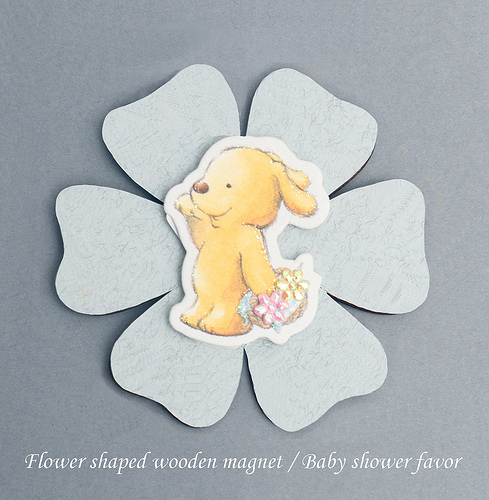 However, to add more interest to the magnet favors we have chosen to present them in a more colorful and luxurious way, please see our suggestions below. 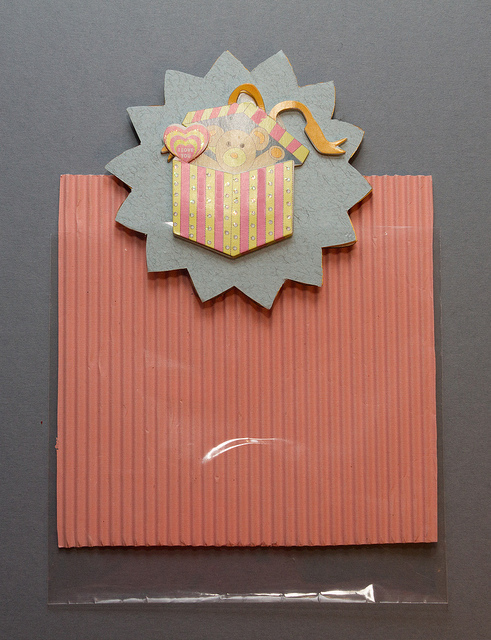 You will need clear cellophane envelopes and nice quality colored paper. Decorative hand made paper is very rich and luxurious, corrugated paper is very beautiful as well and comes in many colors and finishes and it is very economical. 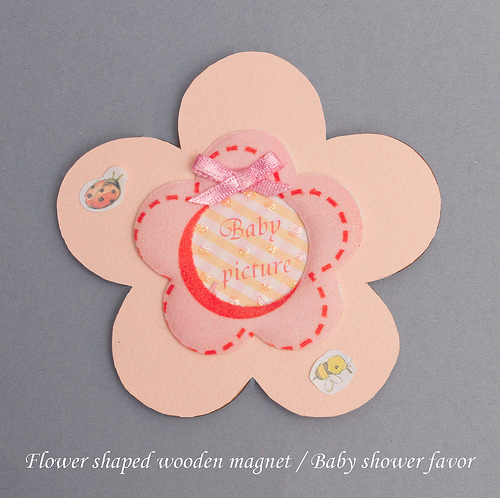 Cut the paper to a size slightly smaller than of the cellophane envelope and slide it inside, then lower the wooden magnet and place it in the center of the paper. If you want it to stay in place stick a small piece of strong double sided tape to the magnet itself underside. Close the edge with a circular clear sticker. 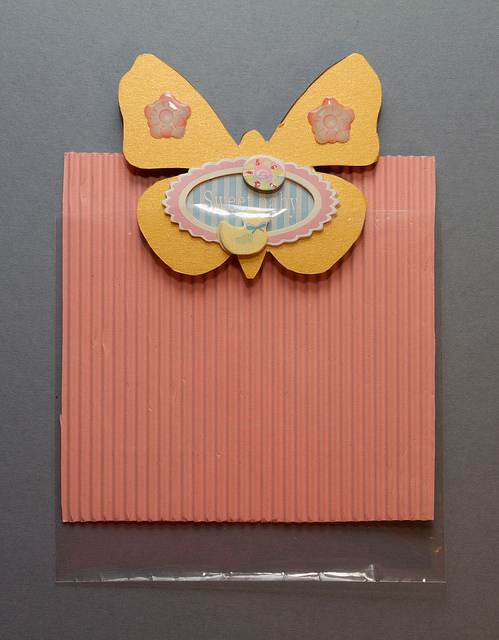 Please scroll down the page to see our gift wrap ideas.